Captain Charles Myrick by Eastman Johnson (1824–1906), 1879. All objects illustrated are in the collection of the Nantucket Historical Association, Massachusetts. Gift of F. S. Church. A chat with Michael Harrison, curator at The Nantucket Historical Association, which brings this year’s loan exhibition to The Winter Show in New York. The Magazine ANTIQUES: When you think of Nantucket’s past, you think of whaling—and you’ve certainly brought a lot of that material to the Winter Show. But you’re also presenting a great array of work in the fine and decorative arts. How do those pieces reflect the island’s history? Michael Harrison: The arts on Nantucket were influenced a lot by the nature of the culture on the island. It was for a century a Quaker stronghold, so despite its prosperity from whaling before the American Revolution, there wasn’t necessarily a really strong art tradition on Nantucket in that era. We’ve sent the show the earliest oil portrait in our collection. 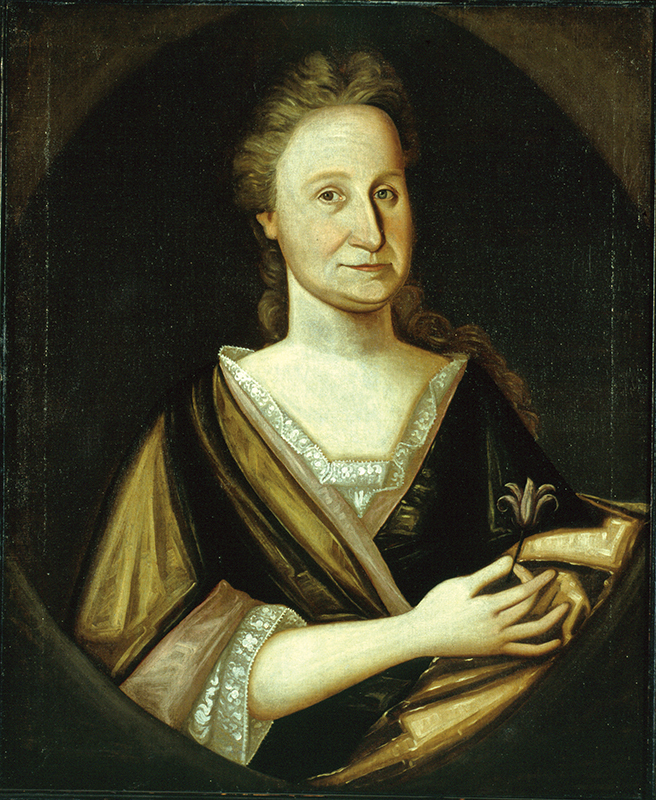 It’s from about 1720 and it depicts a local woman, Mary Gardner Coffin. But it was painted in Boston because nobody was coming to Nantucket to paint portraits in 1720 or 1730; there wasn’t a market for it. There was a Quaker antipathy to having your portrait painted and hanging it on your wall—that was not sufficiently modest and plain, or practical. 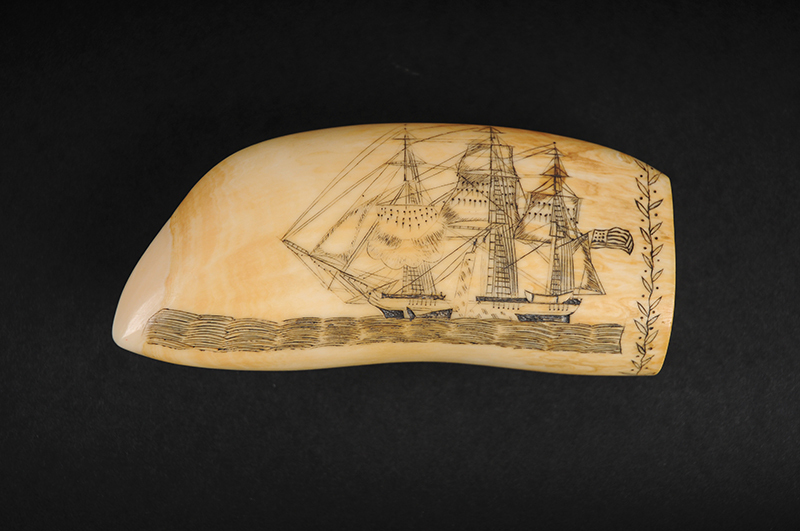 Sperm whale tooth engraved by Edward Burdett (1805–1833), 1825. Gift of Robert and Nina Hellman. TMA: Did the same conditions apply to crafts such as silversmithing? MH: The tradition of American silver making certainly existed on Nantucket. There were two important silversmiths in particular working here before the revolution, making beautiful spoons and porringers and those kinds of things. But if you look at Nantucket household inventories in the eighteenth century for silver, there’s no jewelry, there’s no silver plate. All the stuff that you see elsewhere in Massachusetts typically—you’ve got a suite of silver spoons, you’ve got a suite of plates, you’ve got some jewelry for your wife, you’ve got shoe buckles—not on Nantucket in 1750. It’s too showy. That starts to change later. Mary Gardner Coffin, attributed to the Pollard Limner (active c. 1690–1730), c. 1720. Gift of Eunice Coffin Gardner Brooks. MH: The earliest really strong art and decorative art items that we have in our collection reflect Nantucket beginning in the 1830s and the 1840s, when Quaker influence was a lot less pronounced. A reputable portrait painter could actually make a business here in the 1830s, whereas one would not have been able to do that in the 1790s. William Swain was the prominent local portrait painter from the 1830s, and we have a number of paintings by him in our collection. We’ve sent two of his works to the show. There’s another artist, James Hathaway, who worked here in the ‘40s, although he’s not quite as good an artist. [chuckle] We didn’t send anything by him. 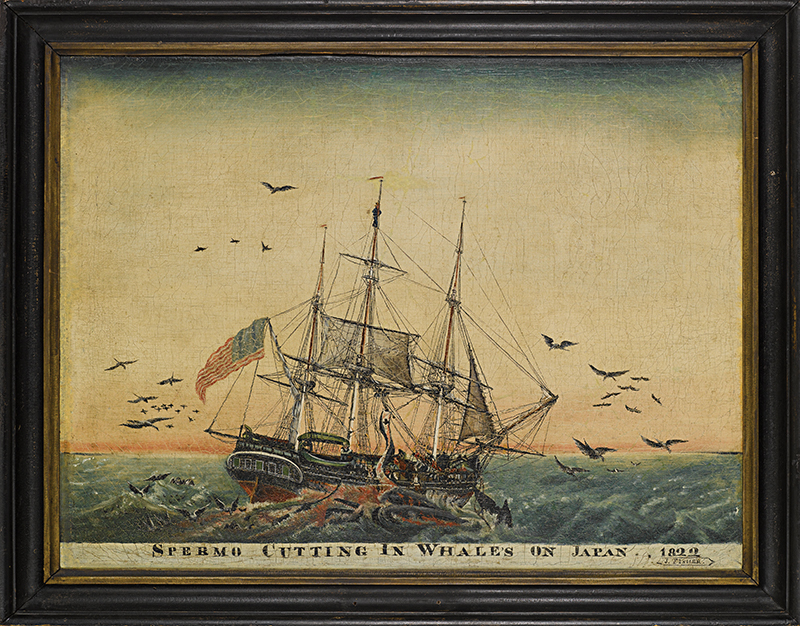 Spermo Cutting In Whales On Japan, 1822 by J. Fisher, c. 1823. Gift of the Friends of the Nantucket Historical Association. TMA: And then one of the New England summer art colonies developed on Nantucket around the turn of the twentieth century. TMA: Painters like Johnson who fostered a romanticized vision of the past must have found a great deal of inspiration on Nantucket, in the decades after the whaling trade ended. 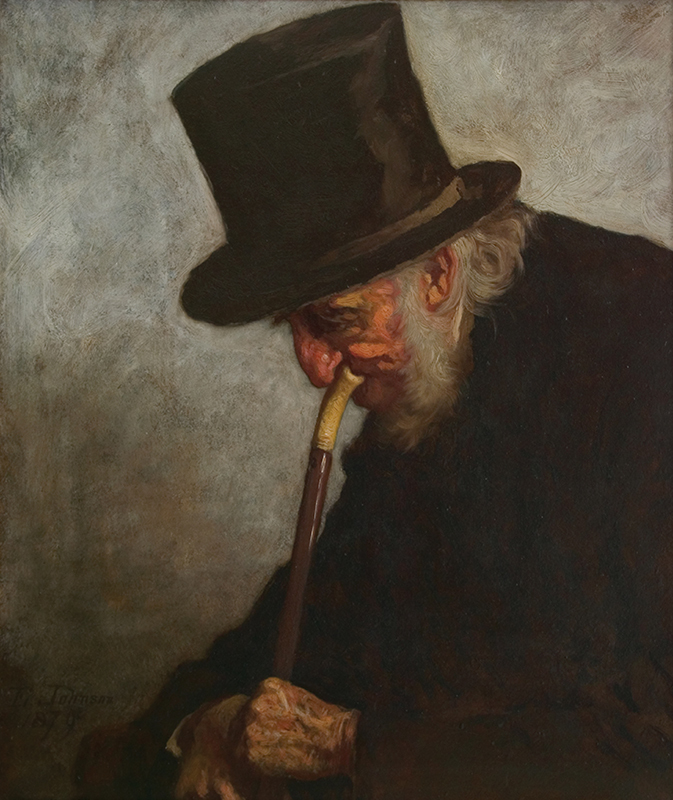 MH: We sent one pretty evocative Johnson portrait of a retired sea captain who’s shown in a very contemplative way. Johnson is trying to capture and depict the faded New England seaport that’s becoming something else, as represented by the old citizens of the island looking back on their glory days. That kind of nostalgia became a Nantucket selling point: old New England; our faded glory. A part of the local economy is built on that image and has been for a long time. Captain Absalom F. Boston by an unknown Prior-Hamblin school artist, c. 1835. Gift of Sampson D. Pompey. TMA: Ralph Waldo Emerson called the island the “Nation of Nantucket,” which suggests a certain inward looking set of mind. MH: The island is a universe unto itself, which has some positive aspects and then some drawbacks. There was a tendency to do local history here in isolation from anywhere else, and a tendency to see Nantucket as exceptional beyond words and unique in all of American experience. And while there are aspects of its history that are fascinating and engaging, different to other places, in many ways it shares many of the same stories of other places in America. TMA: It’s interesting, the title of your exhibition at the Winter Show is Collecting Nantucket, Connecting the World, which suggests there’s a cosmopolitanism to Nantucket’s cultural history. MH: Historically this was a Quaker community far out to sea, but their main business involved ships and going places, and there’s always been a high degree of local literacy. And aside from the island sending ships across the world to hunt whales, lots of ships that are crossing the ocean going to New York and places on Long Island and Connecticut; they’re all sailing past this island. We’re on the main shipping routes up and down the East Coast. So Nantucket was very connected certainly to an East Coast commercial network during its heyday. And the knowledgeable cosmopolitan aspect of Nantucket that existed in the past is certainly promulgated today because so many people live here seasonally, and they come from elsewhere—from Texas and New York and Connecticut and all sorts of places to live here for the summer. So it’s not one of those insular New England communities where you move here and you’re never accepted until twenty-five years down the road. It’s an island. If you don’t accept the people who come here and are nearby, you’re not going to interact with anybody. 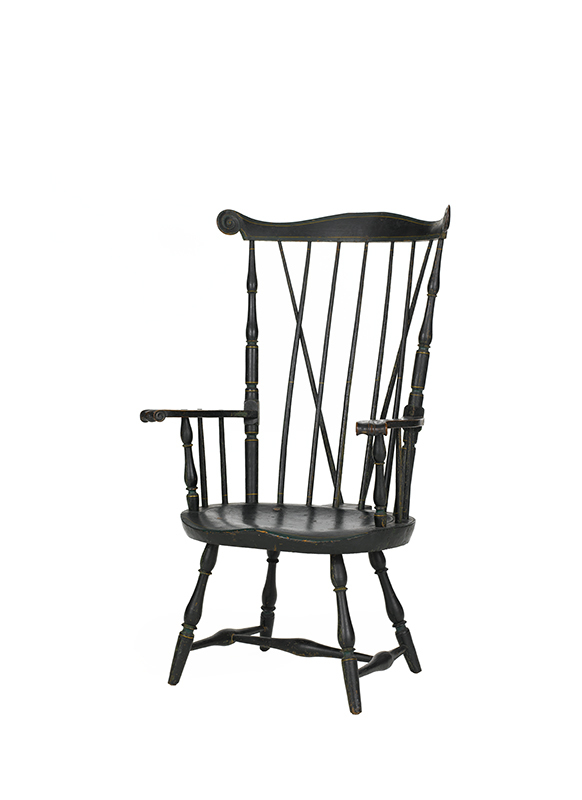 Windsor chair by Frederick Slade (d. 1800), c. 1799. Gift of the Friends of the Nantucket Historical Association. 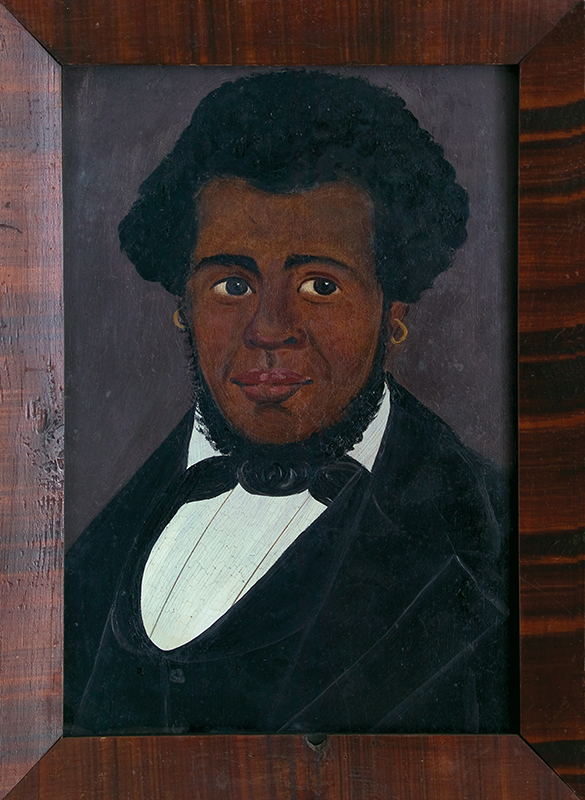 TMA: Works that you brought to the Winter Show— the portrait of Absalom Boston, for example, and the portrait of Sampson Dyer—also seem to highlight the historical diversity of the population on Nantucket, and that’s interesting, too. MH: There are two aspects to that. First, historically, whaling was very labor-intensive. If you weren’t a ship’s officer, or on a career track, you might not want to go whaling more than once. And so the trade provided opportunities. People who might be marginalized in other places could come whaling and maybe get ahead, make a good return for their labor on a voyage. So people like Absalom Boston who were part of a thriving African-American community of sailors were here; there’s this strong story to be told of that on Nantucket. And the Absalom Boston portrait that we have is a really special object. We have it on display in our main gallery most of the time, and occasionally people will say to me, “Oh, it’s so small”—it’s eleven by fourteen inches—and I say: “That’s what he could afford, and that’s what the artists serving the African- American community were painting.” The painting of Sampson Dyer is interesting because he was of both Native American and African descent, and made quite a career for himself at sea. His portrait was painted by a Chinese artist in Canton because he was there on a Nantucket voyage. It’s pretty great stuff. TMA: What’s the other aspect? MH: We as the Nantucket Historical Association collect the whole history of Nantucket for the people of Nantucket. So we are interested in reflecting the people who have been here and the people who are here. It’s always been an island where people were arriving; of labor imported to help make the island work. The English themselves came to this Native American place in order to try and set up farming and animal husbandry, but discovered that didn’t work ‘cause the soil here’s so bad, and they took up whaling instead. Well, there weren’t enough people here. People came here from the Pacific, from the Azores, the Cape Verde islands, from Boston, from Vermont, from all over the place. Then today, we’re the most diverse county in Massachusetts in terms of where people are from, because there’s so much of a demand for landscapers, construction people, plumbers, electricians, all the stuff that makes this, as a place of summer homes, work. There’s all this immigrant labor that makes it work: people from El Salvador, from eastern Europe, from Jamaica and Ireland. And so we want to reflect that in the story we tell of the past, but we are also collecting in the present in order to equip my successor someday to tell stories of today at the Association.